I’m a logical person; my opinions are firmly based in science and fact. I do my research, I weigh up arguments and I look for ingredients that are proven to make a difference. Which is why my sudden interest and passion for alternative (and unproven) therapies has taken me so much by surprise… But I’m really quite fascinated by the spiritual and somewhat illogical concepts of acupuncture, chakras and crystal healing. Over the years I’ve tried pretty much every treatment going (from hot stone massage and cupping, to cranial osteopathy and reflexology) and have seen stronger results with some than others, but after suffering with a rotator cuff injury for over a year (the tendons and ligaments that support the arm at the shoulder joint,) and trying everything mainstream to tackle it I was at the end of my tether. Physiotherapy only temporarily offered support, daily exercises reduced the pain but didn’t stop the discomfort, massage only relieved rather than offering a solution, and even changing my office chair and mattress didn’t provide the difference I needed. I’d been thinking about trying acupuncture for a while, but finally I took the plunge to see if it could make an impact – and blimey, the experience was life changing. I’ve experienced acupuncture a couple of times before, but it’s been for general wellbeing just for the sake of it rather than targeting a specific issue. When I turned up at a spinal health clinic a short drive from my home, I had neutral expectations – I was hoping for the best, but wasn’t expecting miracles from a few needles. After a lengthy consultation to get to grips with the issue as well as my general lifestyle and energy levels, my very calm acupuncturist started to administer needles to key points around my body as well as directly into my shoulder; the weirdest and most intense sensation crept up on me, and I started to feel incredibly woozy (almost like I was about to pass out.) The needles were quickly removed from my shoulder and I was left on my back for a few minutes to let it pass. Apparently it’s really common for such a sensation as we hold so much of our emotional energy in our shoulders, and directly targeting it can cause intense movement that the body finds overwhelming. Coupled with the fact this was where my main issues were, the result was more intense than most! Needles were later applied to other key areas of my body to indirectly target the areas of discomfort, as well as helping to restore balance and overall wellbeing – the main locations being in my hands and feet. After that first session I felt strangely restored and incredibly calm, almost like I’d had the best sleep ever (even though I’d literally been lying on a pop up bed for thirty minutes.) Suffice to say I’ve been going back weekly ever since and the results have been pretty amazing. So how does acupuncture actually work? In traditional Chinese medicine, acupuncture is linked to the belief that pain and disease is caused by disruptions to the flow of energy in the body; the needles stimulate points on or under the skin called acupuncture or acupressure points, releasing this energy, which then travels around the body through channels called meridians. By restoring this energy flow (and stimulating the body’s natural healing response) you can relieve discomfort and restore balance that is present in a healthy body and mind. It may sound a little ‘out there’, but with knowing every cell is made up of energy and a little understanding of the nervous system, it started to make all kind of sense to me – and the results scuppered any kind of doubt too. Amethyst, essential for cleansing and purifying. It can bring a calming influence, and therefore be of great help in times of change, as well as promoting contentment and warding off negativity. Known for helping to promote sleep, it’s also celebrated for its ability to relieve eye strain and headaches as well as soothing skin irritations. Green Moss Agate, essential for confidence and personal growth. This beautifully complex stone is said to balance emotion, enhance concentration, boost endurance and promote success. It’s also known to improve circulation and enhance oxygen in the body, and even ease childbirth. Rose Quartz, essential for nurturing and healing. It can help to ground, promote sensitivity, alleviate fears and provide a sense of security, which is why it’s often known as a stone of love. Believed to help stabalise blood flow and promote fertility, it’s also known to help calm the complexion and reduce redness. 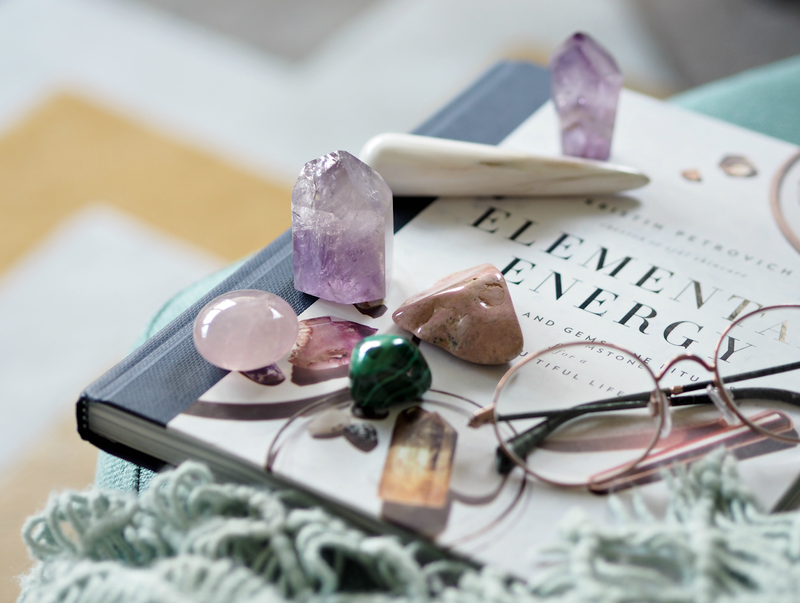 What’s amazing about crystals is that you can use them in many different ways – from using them in meditation, placing them on specific areas of the body to encourage energy flow, carrying them with you or popping on your desk, using them in baths or even creating tonics that can be applied topically. 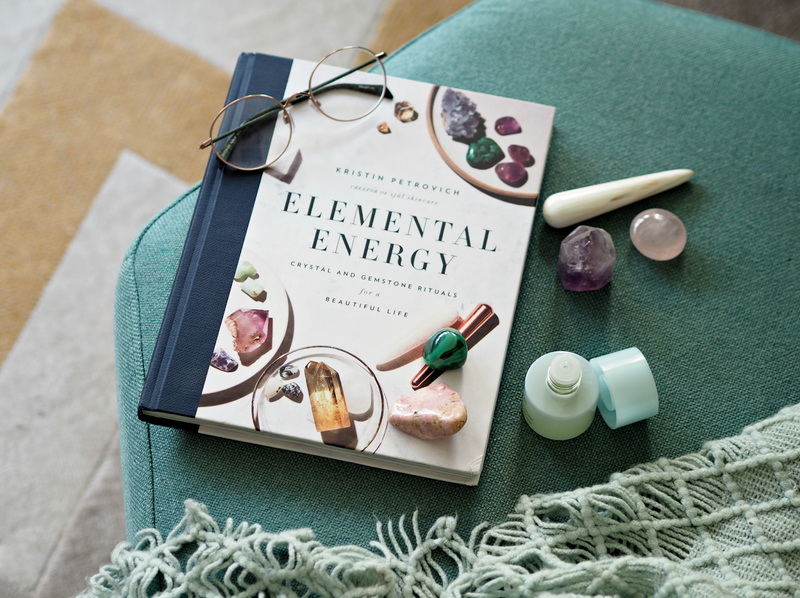 I’m still very early on in my crystal journey, but one of the books that’s certainly helped me to understand and get to grips with the magical potential of these beautiful stones is Elemental Energy by Sjal Skincare founder Kristin Petrovich. 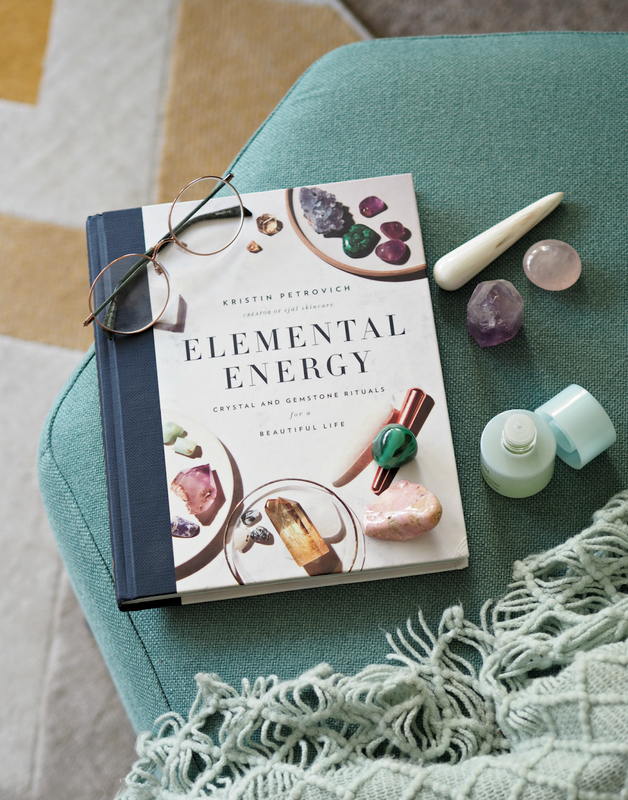 It covers not only how crystals are thought to work, but a breakdown of stones and their qualities, alongside techniques to use them in meditation, massage and bathing. 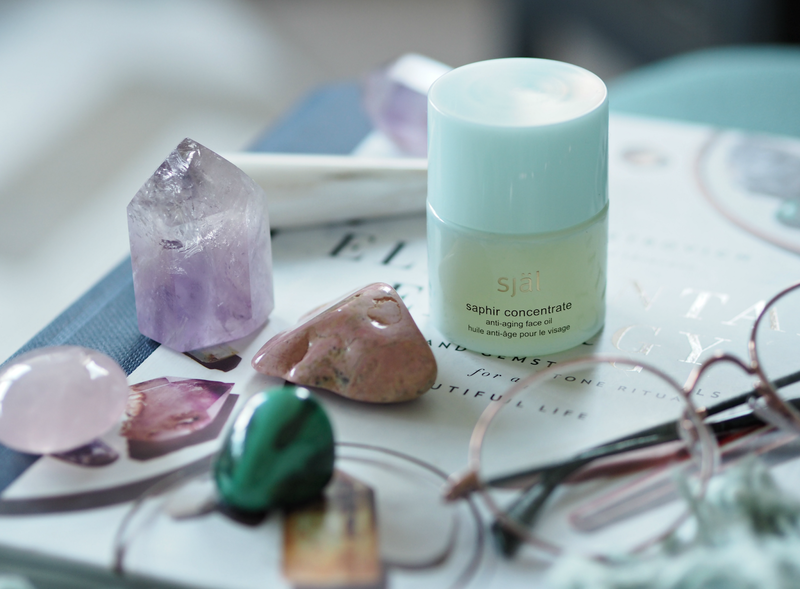 It’s a great place to start if your interest is sparked, or if you just want to get to grips with the different ways crystals can enrich your life, as is her skincare line Sjal which utilises crystals and their corresponding qualities within beautiful formulas to energise the complexion. 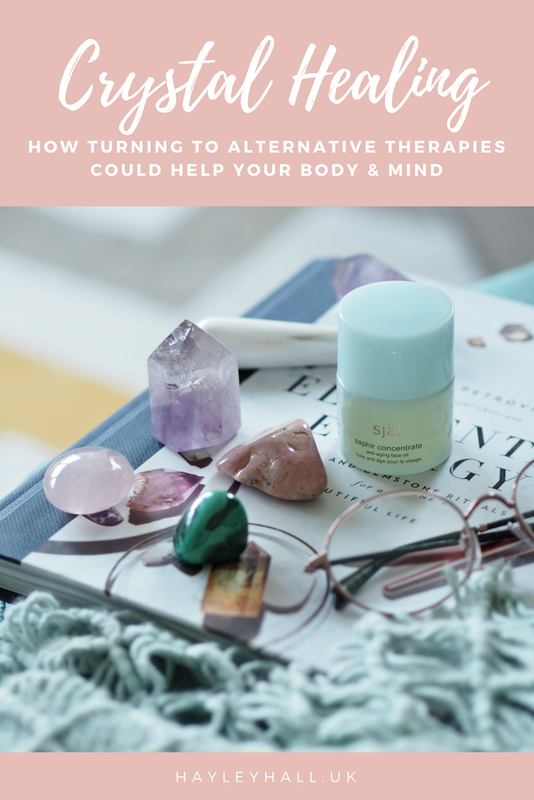 Are you interested in alternative therapies? 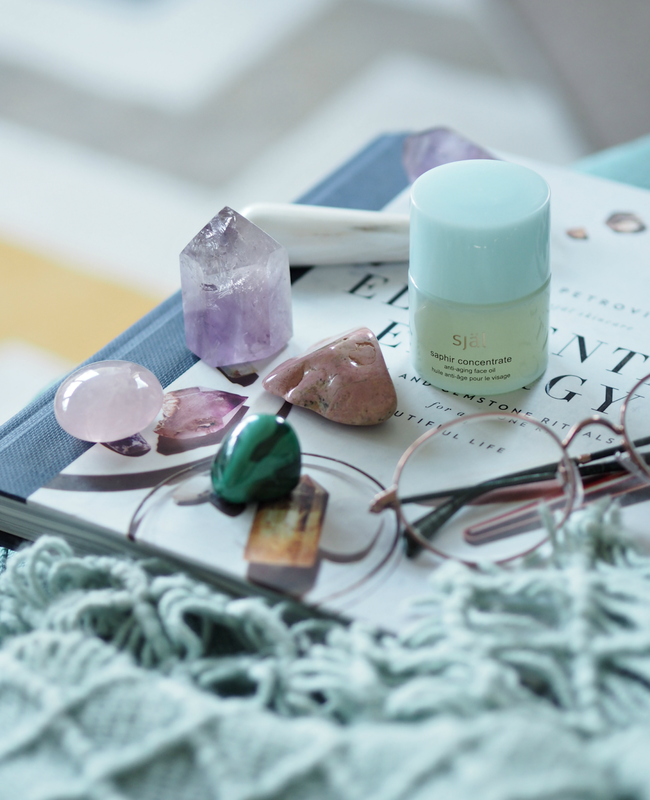 Have you experienced success from acupuncture or are fascinated with crystal healing? 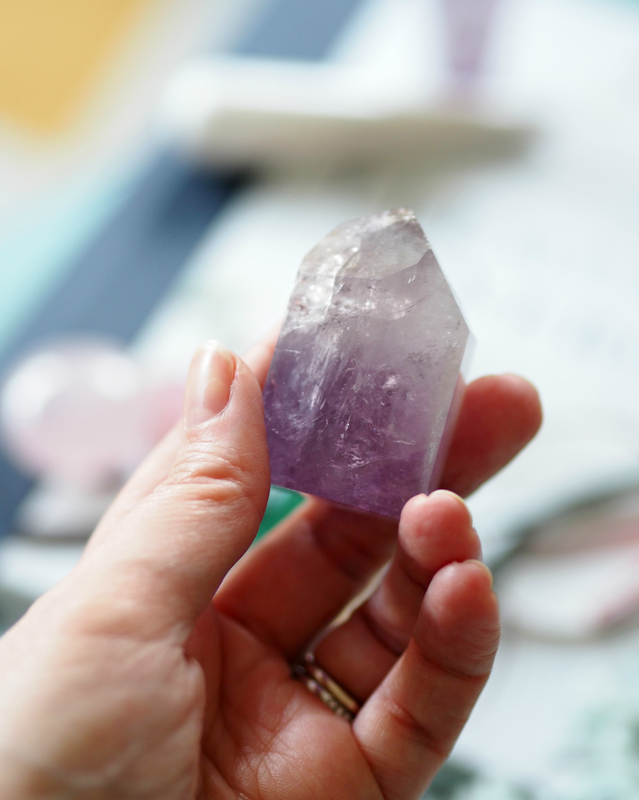 If you’re interested in me covering my journey with crystals further, do let me know! I pay for my acupuncture treatments at Wellness Be, which are £50.00 for a sixty minute session. Buy Elemental Energy by Kristin Petrovich online or in book stores, priced £18.99. I devoured it in a few evenings while it was snowing and loved every page; well worth a read. In terms of general wellbeing, it helps to rebalance your energy so it can help with tiredness or general stress – it's also known to help with everything from weight management, fertility and giving up smoking! If you talk to your therapist she can pinpoint key areas accordingly. They also do a little energy boost in areas of the hands and feet if you need it. Re: crystals, I have a shop near to me that sources authentic crystals. It's important to hold them and pick ones you're attracted to / feel a connection with. It's not something you should really buy online if you can avoid, so look for stockists or pop ups in your area. Hope that helps! I am a big fan of acupuncture, it certainly works for me. I have spinal issues which cannot be treated to to the location (right by my spinal cord and with a 97% risk of paralysis I quickly said no thank you!). Strong pain relief is not as effective as I would like so I combine it with regular visits to a chiropractor who is also trained in acupuncture. I did try acupuncture alone for a number of years but it wasn't as effective as the combined treatment.I also experience menopausal systems thanks to breast cancer treatment and I have auricular acupuncture to manage those pesky hot flushes. It is a marvel and means I can get a full night's sleep without having to change my pjs and sheets. Anything that does that is worth it in my book! That's great to hear it's working so well for you. I definitely think it's about finding the right approach / combo as every body is different – so I'm not surprised it works best in conjunction with a chiropractor. And fab about those hot flushes too! I find it fascinating that the NHS are increasingly turning to alternative therapies (although a lot of the funding has just been removed.) Some of them are amazing and really do help – hope you find solutions that work for you! I’m reallt looking into crystal therapy even if only for placebo like you mentioned as my thought process sounds exactly like yours!! can I ask where you bought your crystals?